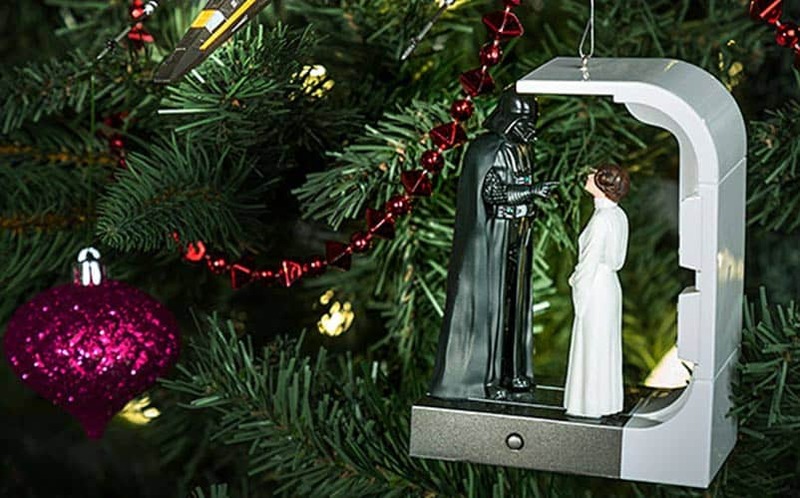 Star Wars Scene Christmas Ornament: Darth and Leia | Nerd Much? It’s that time of year again — when Christmas decorations start popping up at your neighbor’s house, eggnog lattes will soon replace their pumpkin spice predecessors, and soon, we’ll see an influx of classic Christmas movies on TV. It’s probably no secret by now that we love the holiday season, and it’s mostly because it means that there will be some great new Christmas decorations that have a nerdy twist — our specialty here at Nerd Much?. Last week, we presented a unique spin on Christmas coloring books with the Creepy Christmas Coloring Book, and today, we present the Star Wars Scene Christmas Ornament: Darth and Leia by Hallmark. With the holiday season bringing families closer together, we can’t help but appreciate this Darth and Leia scene Christmas ornament, which commemorates when Leia stood up to Darth Vader. While there’s certainly no shortage of cool Star Wars Christmas stuff, I don’t think we’ll ever stop adding to our collections every holiday season. The ornament, which is a genuine Hallmark product, can also be picked up at ThinkGeek. Stay tuned for more nerdy Christmas ornaments over the next few weeks. For more cool nerdy stuff, stay tuned to Nerd Much?. You can also tell us who shot first on Twitter.